The duplicator cannot be used on a netting account. This utility works as described. Usefull if you prefer to scale-out insted of take profit. Example - i want 1,0 lot order. With this utility I send 0,5 lot order, and utility adds another 0,5 lot order. When i see some profit i close 0,5 manually etc.many strategies. Update: each trade can be managed independently. You can choose to (1) follow TP or/and SL of SOURCE trade, or (2) not follow. Critical in many strategies. Added warning that the adviser is already installed on the chart. 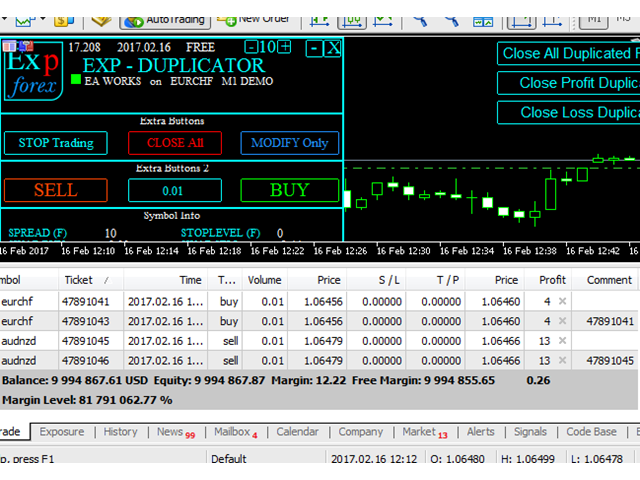 Attention: To duplicate all positions, our advisor should be set only on 1 chart! ModifySLTPfromMainPosition - Change StopLoss and TakeProfit by the levels of the main position. If ModifySLTPfromMainPosition = true, then our program will modify StopLoss and TakeProfit every time StopLoss and TakeProfit change at the main position. 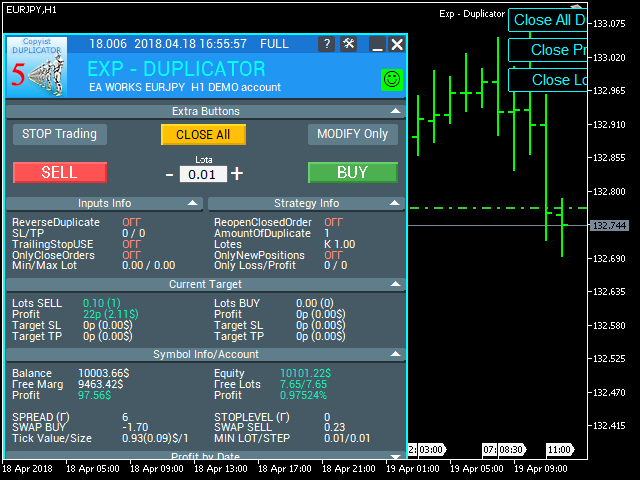 If ModifySLTPfromMainPosition = false, then our program will set StopLoss and TakeProfit only when opening a position and will not change these levels. The EA operation speed has been increased 2! times. Added the MilliSecondsTimerForMonitoring parameter for the EA calculation in milliseconds. MilliSecondsTimerForMonitoring=500 means that the EA checks all trades every half a second. Fixed the error with modification of stops!